WordPress is one of the most popular blogging platforms in the world, in use on over 60 million websites (according to Wikipedia). It’s not hard to understand why: WordPress is incredibly easy to use, comes with thousands of extensions and themes, and is completely free and open source. If you’re looking to create a personal or small business website or blog, the Bitnami WordPress Stack is the quickest and easiest way to get started with WordPress. It comes with a pre-configured, secure and up-to-date installation of WordPress that you can immediately deploy and begin working with. This guide will assume that you already know the basics of using the Bitnami WordPress Stackand will walk you through more complex tasks, such as connecting to the WordPress MySQL database, installing an SSL certificate, and using a custom domain. 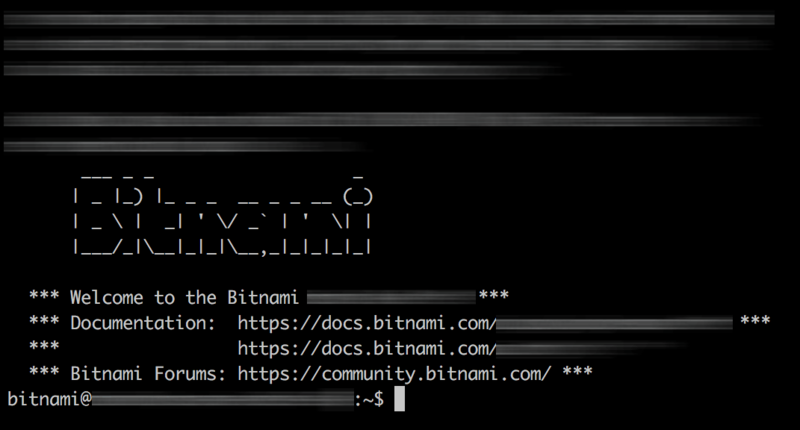 You have deployed Bitnami WordPress using the AWS Marketplace and have the corresponding SSH private key in PEM format. In case you don’t know how to perform these tasks, our handy guide to getting started with Bitnami applications in the AWS Marketplace will walk you through the process. 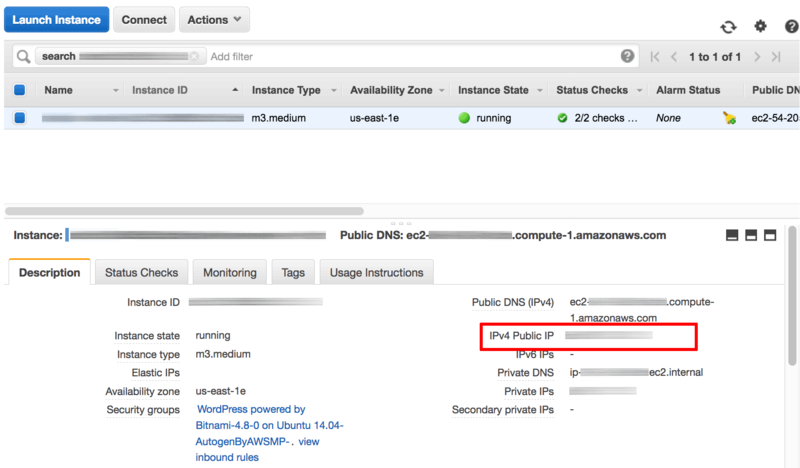 You have obtained the public IP address of your WordPress server from the AWS EC2 Console. In case you haven’t, use the image below as a reference to locate your server’s public IP address. While you can perform many WordPress configuration tasks using the WordPress Dashboard, there are some tasks which can only be performed directly from the AWS server command prompt. Therefore, you should become familiar with connecting to the AWS cloud server using a Secure Shell (SSH) login and executing commands at the console prompt. You will connect to the server using an SSH client from your Windows, OS X or Linux desktop. As a necessary pre-requisite, you will need the SSH private key (PEM file) that you used to deploy the AWS server. If you’re using a Windows desktop, you should download and install PuTTY, a free SSH client for Windows and UNIX platforms. If you’re using a Linux or OS X desktop, you can use the SSH client that is already built in to these operating systems. Click the “Load” button and select the AWS private key file in PEM format. Once the private key has been imported, click the “Save private key” button to convert and save the key in PuTTY’s PPK key file format. Launch PuTTY by double-clicking the putty.exe file in the PuTTY installation directory. 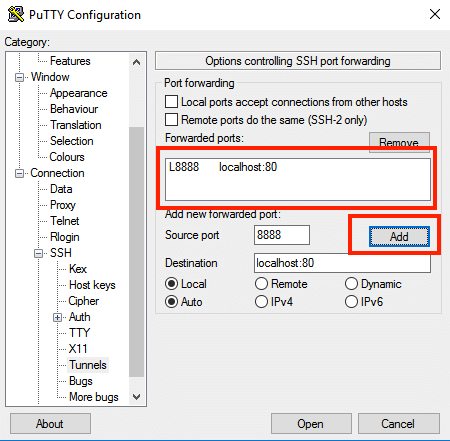 In the PuTTY configuration window, enter the host name or public IP address of your server into the “Host Name (or IP address)” field, as well as into the “Saved Sessions” field. Click “Save” to save the new session so you can reuse it later. In the “Connection -> SSH -> Auth” section, select the private key file in PPK format. Select the saved session and click the “Open” button to open an SSH session to the server. 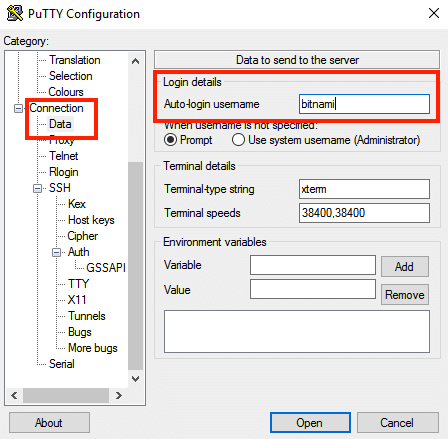 PuTTY will ask you to confirm the server’s host key and add it to the cache. Go ahead and click “Yes” to this request. Remember to replace KEYFILE in the previous commands with the path to your private key file in PEM format, and SERVER-IP with the public IP address or hostname of your server. Up until this point, you would probably have been accessing your WordPress blog or website using the public IP address associated with it. However, if you already have a domain name, it’s easy to associate this domain name with your WordPress deployment. AWS instances are launched with a dynamic IP address by default, which means that the IP address changes every time the server is stopped and restarted. If you wish to use a custom domain with the Bitnami WordPress Stack, you must first add a static IP address (also known as an “elastic IP”) to your AWS server. Log in to the AWS EC2 Console. In the left navigation bar, select the “Network & Security -> Elastic IPs” menu item. 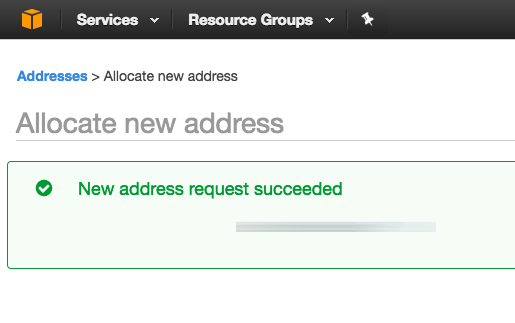 Click the “Allocate New Address” button. Click “Allocate” in the next screen. A new static IP address will be generated and will appear in the list of available IP addresses. 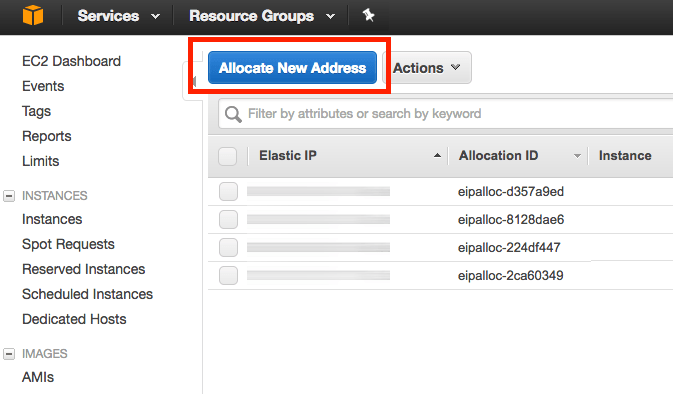 From the “Actions” drop-down menu, select the “Associate Address” menu item. 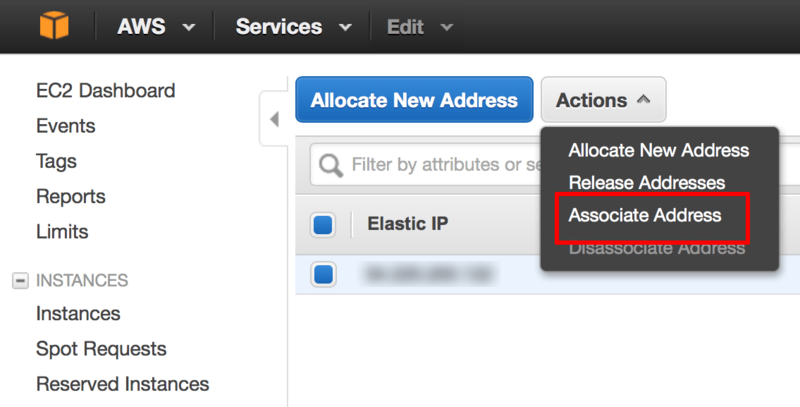 In the resulting dialog box, enter the instance ID of your server and click the “Associate” button. The elastic IP address will now be assigned to your server and will persist even if you shut it down or reboot it. Once the DNS information has been updated and propagated, entering your domain name into the browser address bar should take you to the Bitnami WordPress Stack on the AWS cloud server. You should now be able to browse to the specified domain name and see your WordPress blog/website. By default, the Bitnami WordPress Stack has a Bitnami badge at the bottom left corner of the welcome page. Clicking this badge displays a page with information about the installed application and links to documentation. While this is useful when you first deploy WordPress and are trying it out, you should remove it once your WordPress blog/site starts receiving “real” visitors. NOTE: The steps above only remove the badge. You can still access the Bitnami information page by manually browsing to http://SERVER-IP/bitnami/index.html, where SERVER-IP is the public IP address of your server. Let’s Encrypt is a free Certificate Authority (CA) that issues SSL certificates. 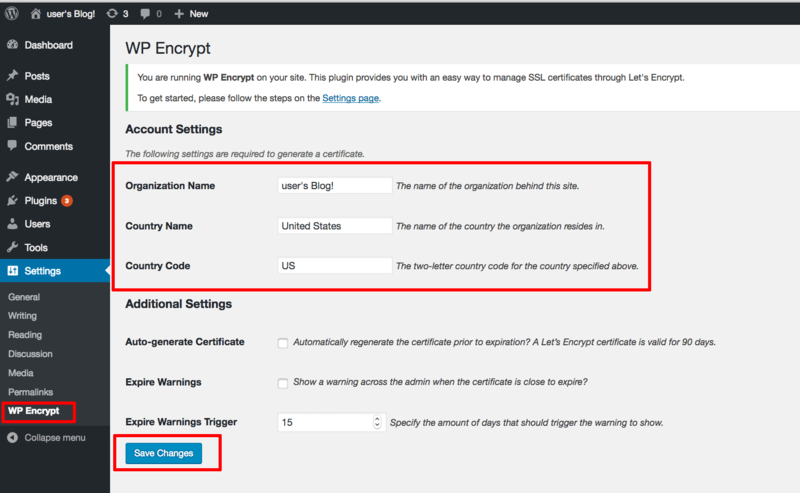 You can use these SSL certificates to secure traffic to and from your WordPress blog or website. Edit the /opt/bitnami/apps/wordpress/htdocs/wp-config.php file in a text editor and add the line below to the end of the file. Save the changes. Log in to the WordPress Dashboard using the administrator account (if you’re not already logged in). Type “wp encrypt” in the search box. 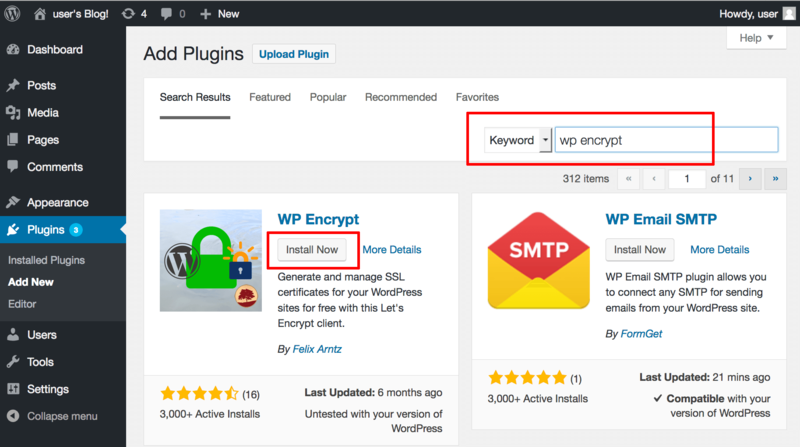 Install the “WP Encrypt” plugin by clicking the “Install Now” button. Once installed, click the “Activate” button to activate the plugin. 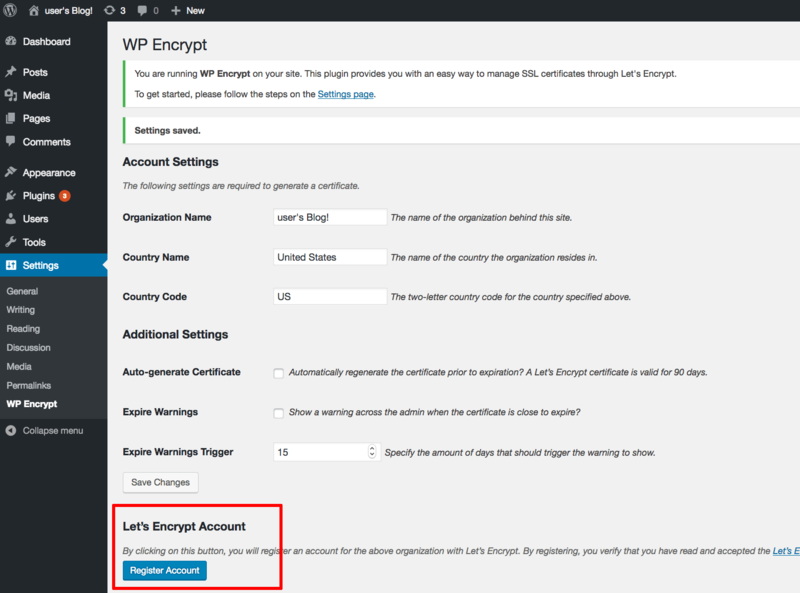 On the “Settings -> WP Encrypt -> Account Settings” page, enter the organization name, country name and country code. These values are required to generate a certificate. Click “Save Changes” to save the settings. Click the “Register Account” button to register an account with Let’s Encrypt. 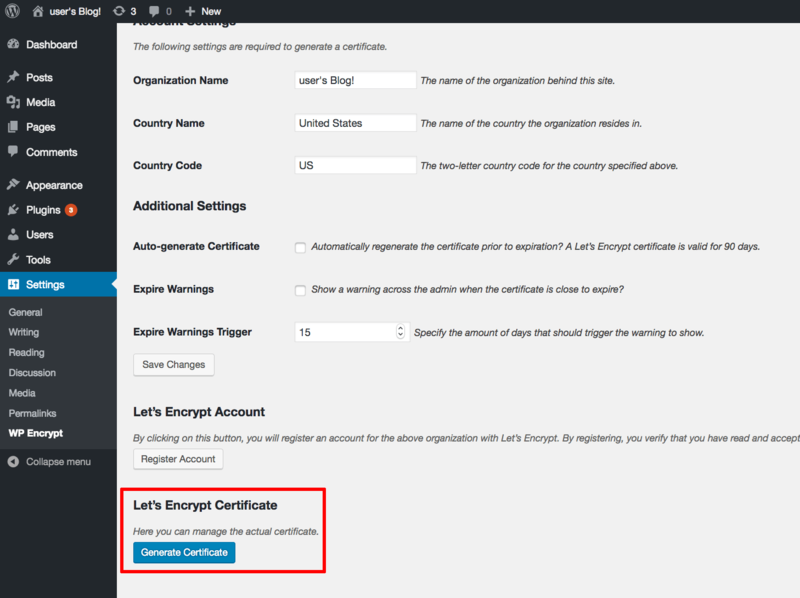 Once the account has been successfully registered, click the “Generate Certificate” button to generate the actual certificate. Log back in to the server using SSH. Link your SSL certificate and certificate key file to the correct locations by executing the following commands. Remember to replace the DOMAIN placeholder with your actual domain name. Now, when you browse to your domain, you should automatically be redirected to a secure (HTTPS) page, indicated by the appearance of a padlock icon in the browser address bar. 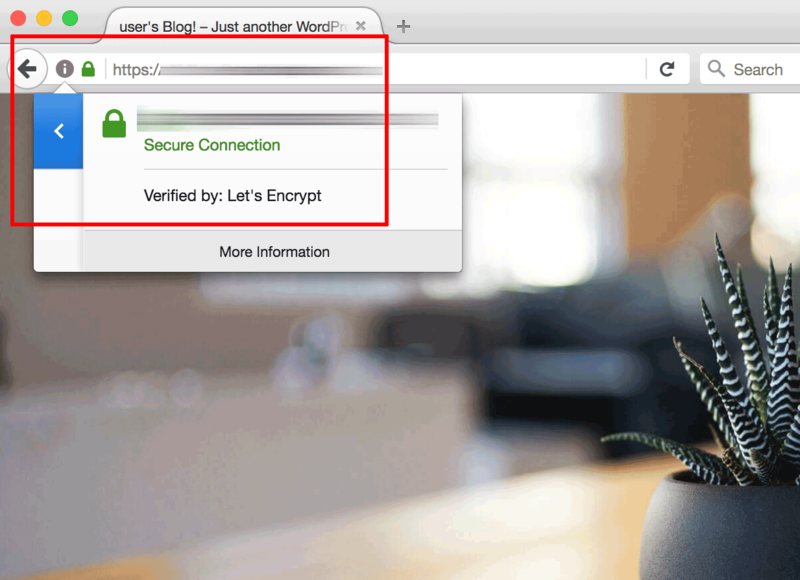 Clicking the padlock icon should display the details of the SSL certificate generated by Let’s Encrypt. 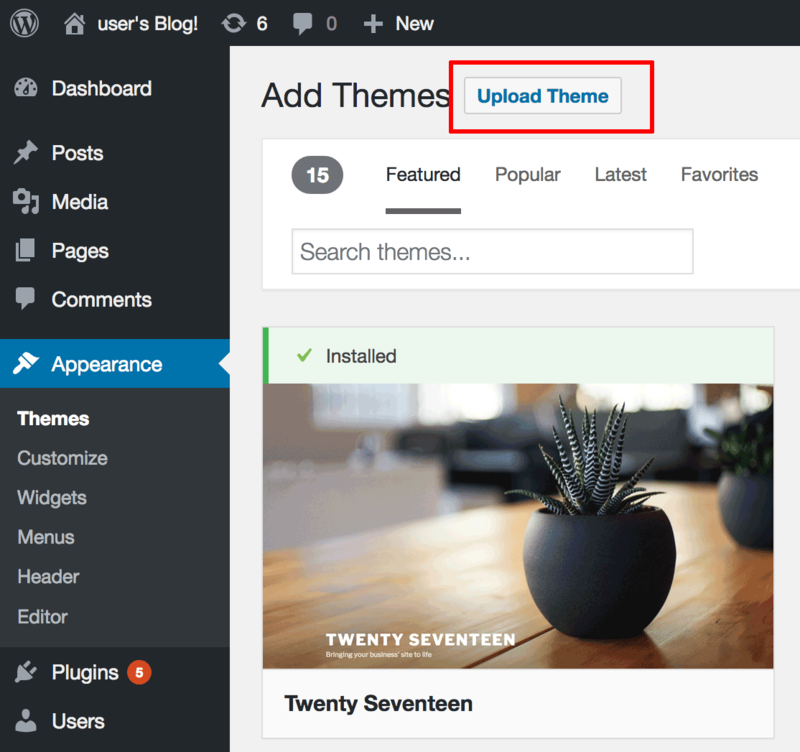 There may be occasions when you need to upload one or more files to your WordPress installation. Typically, the need for this will arise if you wish to install a custom theme or plugin, or if you are developing your own theme or plugin. 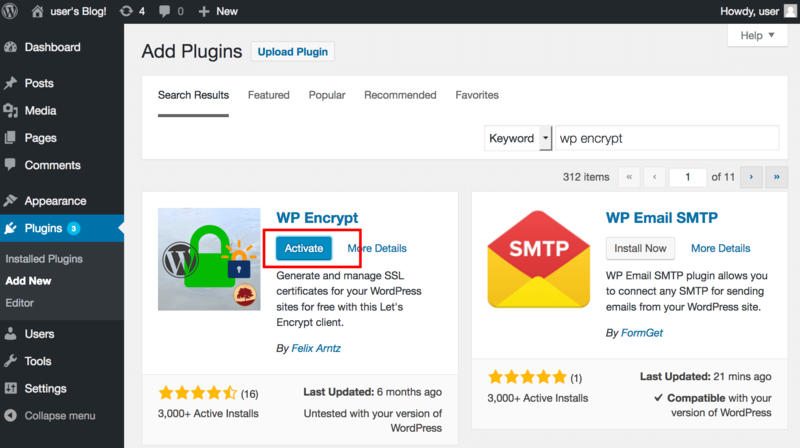 Navigate to the “Plugins -> Add New” page and click the “Upload Plugin” button. Click the “Browse…” button and select the ZIP file containing the plugin you wish to install. Once the plugin has been uploaded, click the “Install Now” button to install it. Activate the new plugin using the “Plugins -> Installed Plugins” page. Navigate to the “Appearance -> Themes” page and click the “Add New” button. On the resulting page, click the “Upload Theme” button. Click the “Browse…” button and select the ZIP file containing the theme you wish to install. 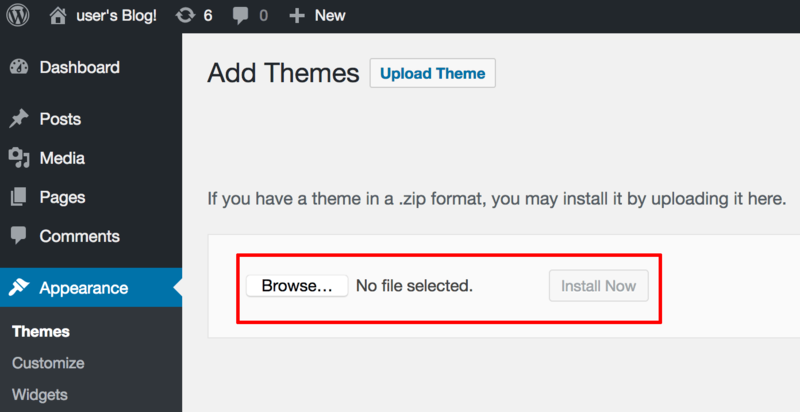 Once the theme has been uploaded, click the “Install Now” button to install it. Activate the new theme using the “Appearance -> Themes” page. 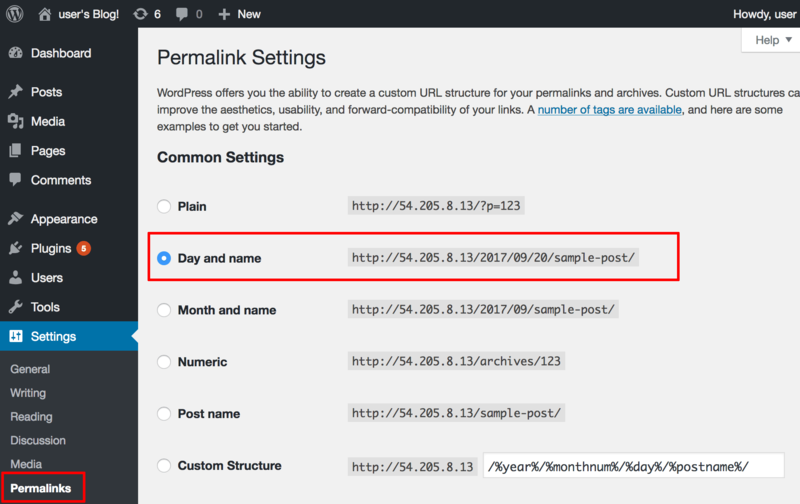 By default, the Bitnami WordPress Stack uses “pretty permalinks”, wherein each post is identified by a unique URL containing the year, month, day and human-readable post title, such as http://DOMAIN/2017/08/07/my-first-post. However, you can customize how these URLs are generated, by changing the sequence of items or adding others such as the category name or author name. Navigate to the “Settings -> Permalinks” page. You will find a complete list of supported placeholders in the WordPress documentation. Click “Save Changes” to save and activate the new permalink structure. NOTE: Changes made to permalink structure will also affect previously published posts and pages. To avoid broken links, use a plugin like the Redirection plugin to redirect users from the older, broken URLs to the newer ones. 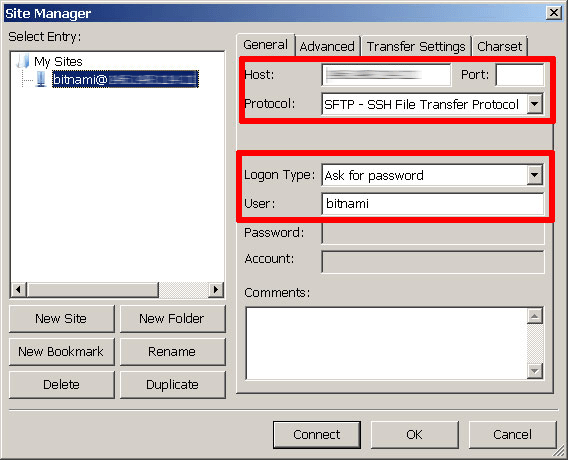 Use the “Connect” button to connect to the server and begin an SFTP session. You might need to accept the server key, by clicking “Yes” or “OK” to proceed. You should now be logged into the /home/bitnami directory on the server. Using the file navigator, browse to the correct directory. For example, /opt/bitnami/apps/wordpress/htdocs/ is the default location for the WordPress files. You can now transfer files by dragging and dropping them from the local server window to the remote server window, or vice-versa. One of the most important components of the Bitnami WordPress Stack is its MySQL database. All your pages, posts and comments are stored in the database, together with user credentials, configuration options and other important bits of information. 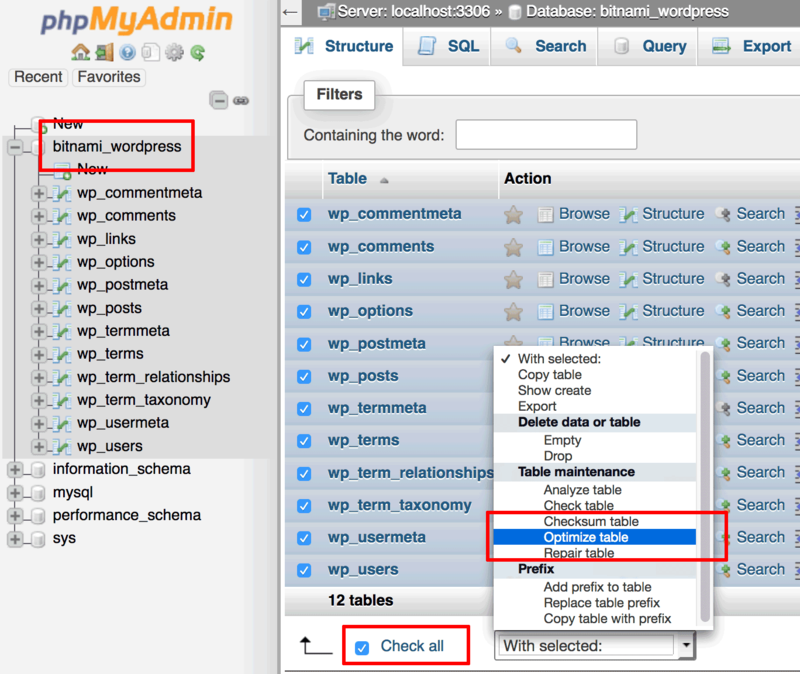 The Bitnami WordPress Stack includes a Web-based MySQL administration tool named phpMyAdmin. phpMyAdmin provides a point-and-click interface to many common database management tasks, making it easy to work with the WordPress database using your Web browser. For security reasons, phpMyAdmin is accessible only when using 127.0.0.1 as the hostname. To access it from a remote system, you must create an SSH tunnel that routes requests to the Apache Web server from 127.0.0.1. This implies that you must be able to connect to your server over SSH in order to access it remotely. NOTE: phpMyAdmin is a powerful database management tool and using it incorrectly could corrupt your WordPress installation. Before making any changes to your database using phpMyAdmin, it is a good idea to back up your WordPress deployment so that you can easily recover it in the event of an error. After configuring this tunnel, continue connecting as usual. 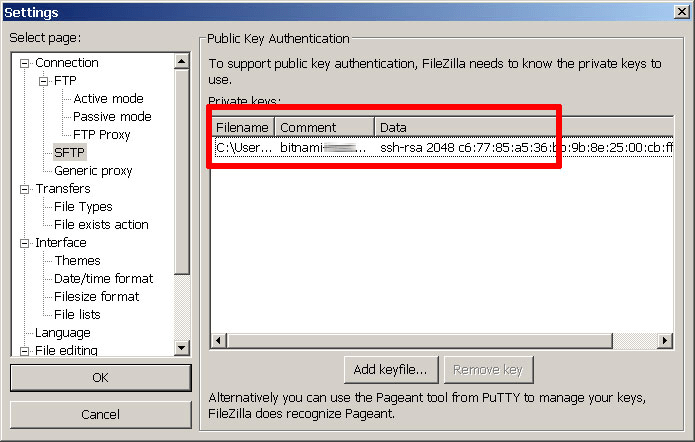 Remember to replace KEYFILE in the previous command with the path to your private key file in PEM format, and SERVER-IP with the public IP address or hostname of your server. 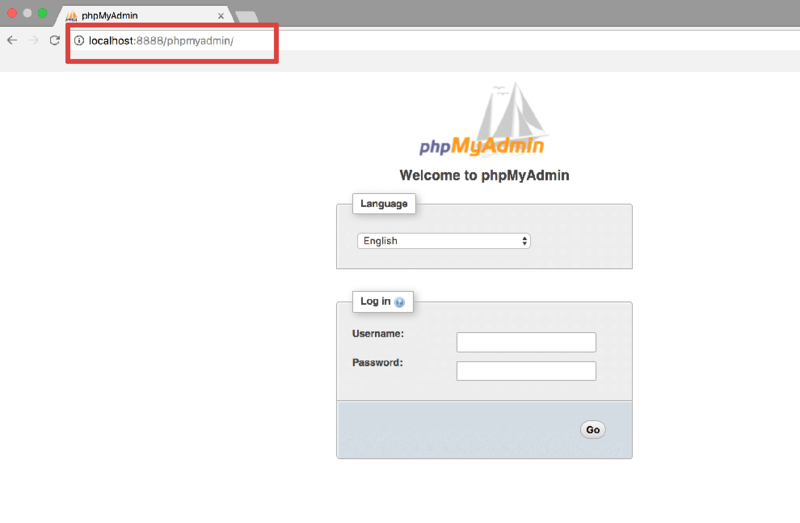 Log in to phpMyAdmin with the username root and the randomly-generated password generated when the server was deployed. Once logged in, you should be able to access and manage the WordPress MySQL database, which by default is named bitnami_wordpress. Select the “SQL” menu item. In the “Run SQL query” field, enter the following SQL query. Remember to update the NEW-PASSWORD placeholder with the new administrator password. Click “Go” to run the query. You should now be able to log in to the WordPress dashboard using the new password. In the “Run SQL query” field, enter the following SQL query. Remember to update the NEW-USERNAME placeholder with the new administrator username you wish to use. 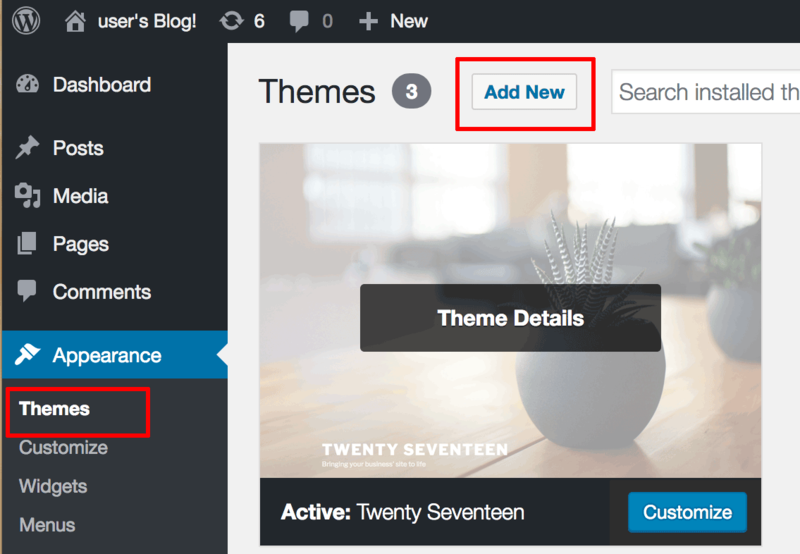 You should now be able to log in to the WordPress dashboard using the new username. Select all the available tables using the “Check all” checkbox. From the available list of operations, select the “Table maintenance -> Optimize table” menu item. Your tables will now be optimized and phpMyAdmin will display a summary of the results.